In 1911 the newly built Mt. 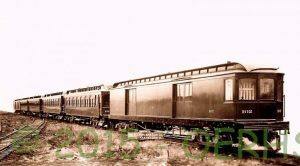 Hood Railway ordered 4 passenger and 2 baggage/express cars for the Bull Run line from Kuhlman Car Company. 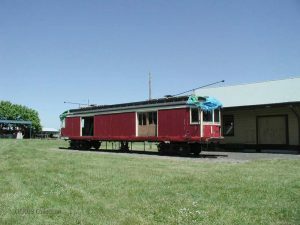 The cars were pulled by steam engines until Portland Railway, Light and Power purchased the company in 1912 and completed the overhead. 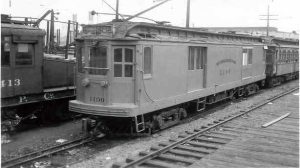 The baggage cars, numbered 101 and 102, were renumbered 1190 and 1191. They were both converted to Mail/Express cars. On June 27, 1917, Helen Metzger, a high school student, was taking her grandparents, Mr. and Mrs. Lindsey home. She was driving her mother’s new Model T Ford, bought about a week before, and was just learning to drive. Heading north, the car came to a bridge that spanned Johnson Creek at Hogan Station, about 2 miles southeast of Gresham. The 3:45 Portland-Estacada mixed mail and passenger train was running south on the Springwater line. As the train was passing Hogan Station, the model T can to a stop on the bridge, and then suddenly shot forward in front of the train. The motorman applied the brakes, but the mail car #1191 hit the automobile. The Model T was torn to pieces with parts being scattered along the 400 feet that it took to come to a stop. The gasoline tank exploded and set the mail car on fire. In a short while several hundred spectators arrived at the scene. 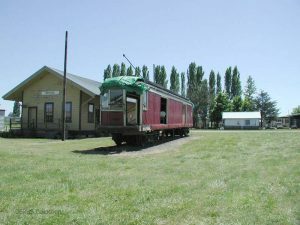 The passenger coach attached to the mail car was uncoupled and run back to keep it from burning. In a few minutes the mail car was engulfed by flames and burned to the floor. The mail and baggage were saved. The flames were extinguished when a tank car arrived. Mr. Lindsley died a few minutes after the crash. Two ambulances from Portland took the women to Good Samaritan hospital where Mrs. Lindley died about 7 o’clock. Their granddaughter died about 4 o’clock the next morning.